Aesthetic Dermatologist, Antiageing expert, Obesity Consultant, Medico-legal Consultant. M.D, Fellow in Aesthetic Medicine, PGD. Hospital Management, PGDMLC, PGD Cosmetology, Trichology and Weight Management, Anti-Aging Medicine. Dr. Rekha was in the field of medicine from the year of 1995. From 1995, she started practising as an aesthetic and obesity consultant. She had her academic trainings from ICLS (Mum), Kalina University (Mum) and Symbosis University. 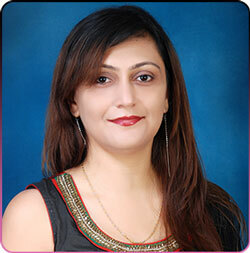 She is an expert in different fields such as hair treatment, cosmetology, weight management etc. In her medical career, she had handled a good number of successful cases. Her experience and expertise made her one of the most demanded doctors in the field. Apart from all these, 'Panchkarma treatments' makes us unique from all other cosmetic clinics. We are proud to offer such variety of services at our clinic.